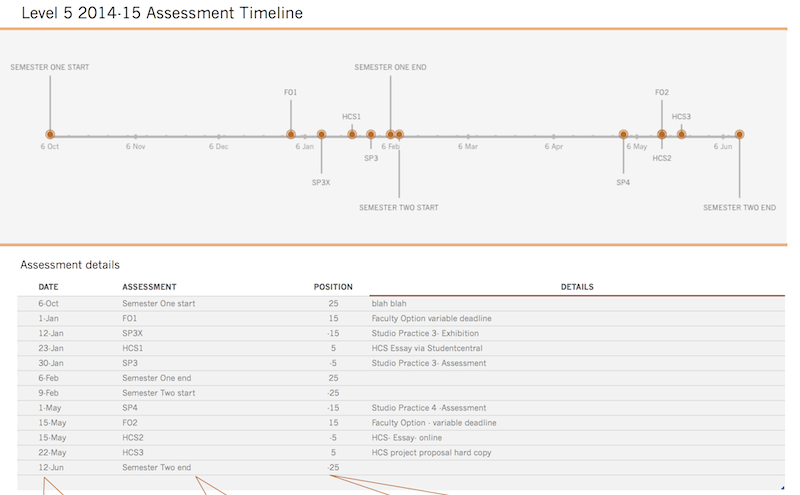 This post is very much thinking out loud…As previously discussed we’ve been looking for a simple way of generating assessment timelines using readily available tools, and little or no training overhead and minimal ongoing support. 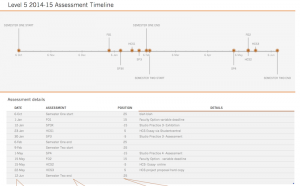 We’ve found a useful Excel timeline template the output of which should help staff visualise assessment timing, and consider the overall assessment burden on their students… and once set assist students in their time management. But what’s the best way of rendering that data? In documents it’s a clear case of copy and paste from the source spreadsheet, but online, how well does Excel data travel. Linking to a spreadsheet is a bit poor, the spreadsheet has to be downloaded, though it may be worth investigating embedding a spreadsheet shared through O365, or Googledocs. Office 365 is a whole different kettle of fish… staff don’t have it by default here, so for the moment I’m going to skip this option (testing offers tantalising hints, but it needs proper investigation). Google doesn’t like the Excel spreadsheet format, but does offer some alternative timeline tools, unfortunately Edublogs doesn’t seem to like the iframe this sits in, and ignores it when added in the “text” view screen. Delighted to find we are running EduBlogs at UoB, and I’ve imported my old posts from robwork.wordpress.com (which was previously rob-work.posterous.com). I apologise for the degraded images, I guess that’s what happens when you save a copy of a copy of a copy. WordPress continues to improve at a shocking rate, and included in this particular bundle is a whole bunch of cracking technology, like the podcast widget. Record something, post it and the feed is built automatically. I’ll pinch my son’s microphone tomorrow and record a demo.